Enjoy the sights and sounds of the private beach in your own back yard! 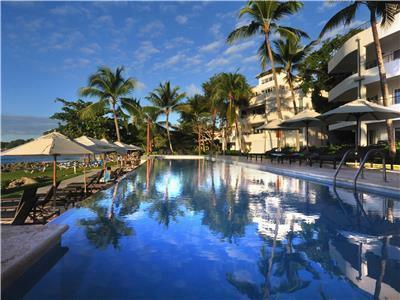 A spacious 214 m2 (2,303 sqft) Oceanfront Condo consisting of 2 bedrooms and 2.50 baths. Stunning ocean views from your elegant beach front apartment will inspire you. 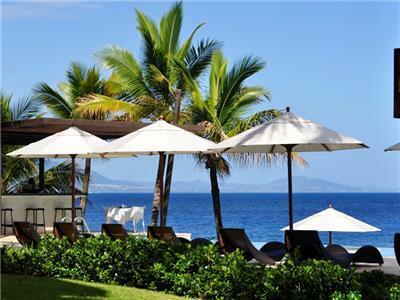 Our spacious 3 bedroom fully furnished Townhouse is located in a private gated oceanfront complex called Infiniti Blu Luxury Ocean Front Condos walking distance to all of the amenities of the town of Sosua. 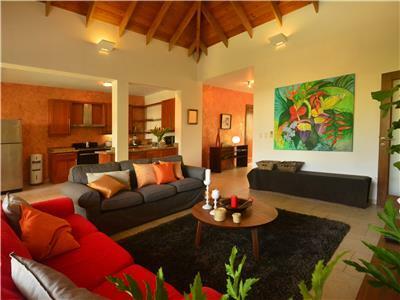 Stunning three bedroom condo with lush pool view for rent in Sosua in luxury residential area. 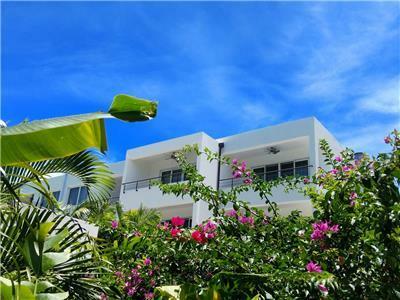 A spacious 214 m2 (2,303 sqft) Oceanfront Condo consisting of 2 bedrooms and 2.50 baths. Stunning ocean views from your elegant ocean front apartment will inspire you. Located in one of the most exclusive residential areas of the North Coast, this stunning 2 bedroom condo combines elegant decor with natural light and comfort and includes everything you could possibly want for a time away from home: fully equipped kitchen, bedding, towels, complete bathroom amenities and much more. 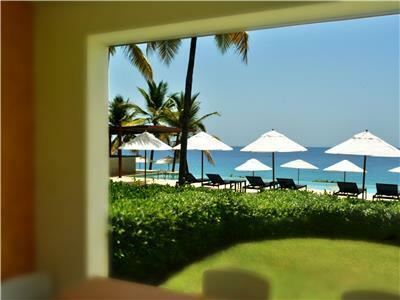 This fully furnished 3 bedroom/3.5 bath Oceanfront condo provides a comfortable oasis during your visit to the Dominican Republic. Enjoy a direct view of the ocean with stunning sunsets from your own private balcony. 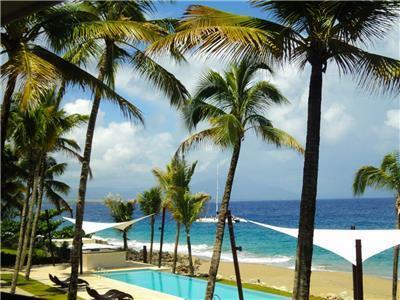 The Perfect Sosua Condo Rentals for Short or Long Term Stays. Dream of being steps away from a stunning and quiet ocean in the Caribbean? Feel at home in this snug one-bedroom apartment and spend your tropical holidays in the Caribbean basking in the sun and dipping into crystal-clear waters. 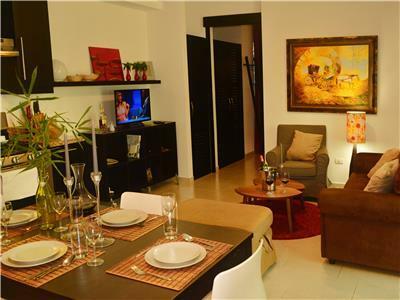 This apartment, ideal for couples, has a practical layout combining kitchen and living room in one open space while still offering the same first-class standard and exclusive material choices known to define the Infiniti Blu residential complex. Furnished with a fresh contemporary style and equipped with all necessities, you will find everything you need here for the ultimate getaway. This cozy and quaint holiday apartment is ideal for couples in search of the perfect Caribbean getaway. 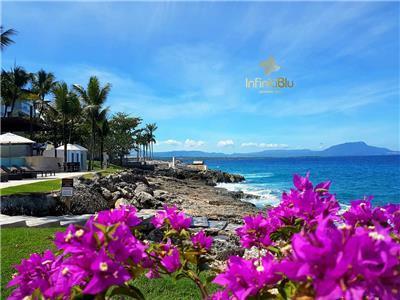 It is located in the heart of Sosua, a special beach town located on the beautiful north coast of the Dominican Republic. The practical layout of this apartment combines the living room and dining room with a solid wooden open kitchen with stainless steel appliances. While being smaller in size, it still offers the same first-class standard and exclusive material choices known to define the Infiniti Blu residential complex. The charming double bedroom hosts its own bathroom equipped with a shower. A terrace with a lush garden view provides an excellent and private space for unwinding with a book or sunbathing. Enjoy the sights and sounds of the private beach in your own back yard! 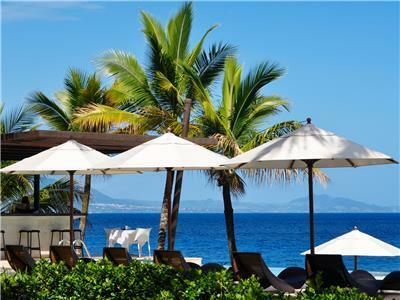 Our beach bar offers all the comfort and luxury of Infiniti Blu, outdoors in front of a beach that is no stranger to whale and dolphin sightings! 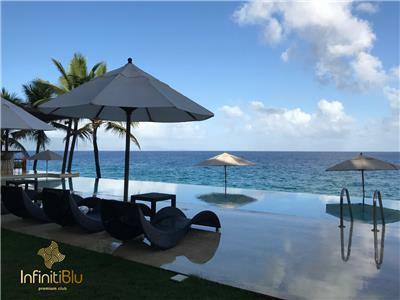 Have drinks and gourmet foods served to you while lounging by our simplistically modern Infinity Pool, or enjoy any Pool Bar menu delights right on the beach!